When considering bicycle maintenance the chain is one component that should be given regular attention. Bike chains get a LOT of abuse. Not only are they a major player in bike propulsion, taking all the driving force our legs can manage to deliver, they also collect road and trail dirt, grime, debris, salt, etc. All of this means that our chains need frequent service to keep our bike’s costly drivetrain in proper working order. Now for the good part, chain maintenance is easy. You will need a rag, an old toothbrush, and some chain lube. Start by brushing off the debris etc. Now re-lube the chain with one drop of lube per chain link pin (the point where links connect). If the chain looks like there is still some debris build up and excess lubricant – use the rag, running the chain through it to clean this off. When lubing a chain, it is the inner part of the chain that needs the slippery stuff. 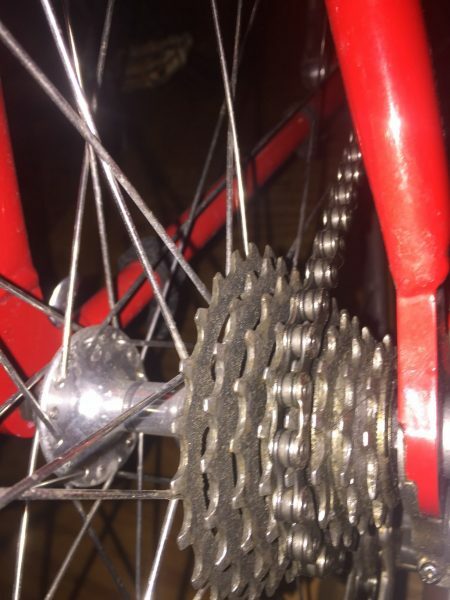 When you are taking care of the chain, look at the small rear derailleur cogs, they could likely use a little brushing of as well. When chains wear out they tend to elongate. It is important to replace an elongated chain before it has a chance to mess up the gearing teeth of the chainring and cassette. This can be done with a special chain measuring tool or with a basic measuring tape. To do this look at any twelve links, it should measure exactly 12 inches across from pin to pin, regardless of the “speed” of the chain.